Our Non-Fading, Quick Dry Formula allows you to finish painting and close your door the same day! The Front Door is the most important element on the exterior of a home. It should stand out and say "welcome". Project your personaility through your front door color, providing a promise of what’s inside. 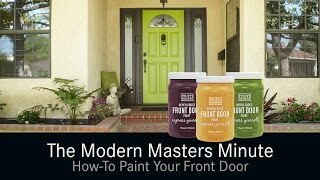 Changing your front door’s color gives you a chance to make an inexpensive mark on your home’s personaility. Our colors were carefully selected, utilizing the Emotional Color Wheel and the latest in color trends and home design from around the world. Perfect for shutters and back doors too!